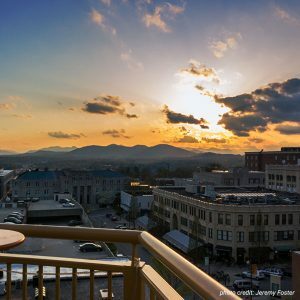 Asheville is arguably North Carolina’s epicenter for adventure and will once again play host city to ECRS’ Ignite 2018 Retail Success Conference in July. While some of the sites listed below require a time commitment, we’ve included quite a few experiences that are quick and nearby to the conference. Whether you plan to arrive in town early for a long weekend or if you’ve got a tight schedule to stick to, we’ve got you covered! We’ve also included several recommendations from ECRS staff. And don’t forget! We’ll even be offering shuttle service and free tastings at the Sierra Nevada Brewery after the conference wraps on Wednesday afternoon. 1. Grab a beer or take a brewery tour. Just google “Beer City, USA” and you’ll see that Asheville is well-known as a brewing hub. With more breweries per capita than almost anywhere else in the U.S., beer lovers are sure to feel dizzy with options. 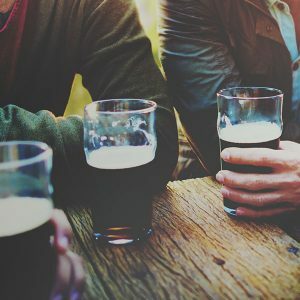 A few popular breweries located less than two miles from the Renaissance Hotel include Wicked Weed, Hi-Wire Brewing, Thirsty Monk, Foggy Mountain Brew Pub, and Burial Beer. Our Infrastructure Engineer, Aaron St. Clair recommends Lexington Avenue Brewery, while Caroline Catoe is a fan of One World Brewing. Don’t forget to take a trip down the road with us to Sierra Nevada’s brewery, after the conference ends! 2. Eat at one of the dozens of great restaurants in Asheville. While Asheville may be well known for it’s beer scene, it’s also a mecca for foodies. 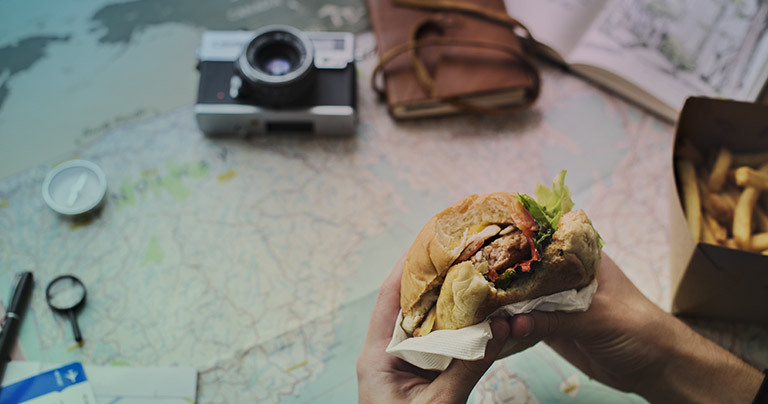 Choose from restaurants that specialize in farm-to-table fare, vegan options, ethnic cuisine, authentic barbeque, and more. 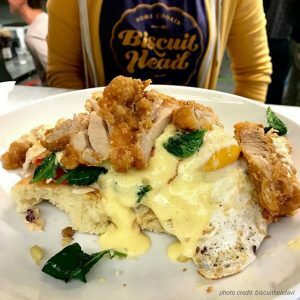 Check out local favorites like Southern-inspired Biscuit Head, bite down on barbecue from Moe’s Original Barbecue, try some mind-blowingly good chips at The Gourmet Chip Company, or grab a coffee at Green Sage. If you’re looking to indulge, you can choose from chocolate, specialty doughnuts, or one of many ice cream shops downtown. French Broad Chocolate Lounge is a top pick for our Database Integrity Manager, Melanie Marshall. Eating and drinking aside, Asheville is an eclectic town with tons to see and hear. Enjoy Asheville like a local as you stroll the downtown city streets and enjoy the relaxed atmosphere of a laid-back mountain town. Hip record shops, unique book stores, and interesting art are all a short walk from the Renaissance Hotel. Our Internet Marketing Manager, Joe Veler, recommends the Battery Park Book Exchange. “There are several bookstores in Asheville, but none like this. It’s a huge bookstore within walking distance of the Renaissance with it’s own wine bar and an eclectic feel. Find inexpensive classics, browse all you want, then sit down and read in an environment akin to an old English library. If you’ve got an extra day, our Functional Software Designer, Matt Renfro recommends watching a sunset at SkyBAR. A few other stops recommended by ECRS staff include Malaprop’s Bookstore, Grove Arcade, Asheville Bee Charmer, Basilica of Saint Lawrence, Chevron Trading Post & Bead Co., Mast General Store, and Earth Guild. 4. Visit the River Arts District. What were once old, abandoned factories and warehouses along the French Broad River have been converted into art studios, galleries, and restaurants. Noted for its creative flair, the 1-mile stretch of the River Arts District, filled with over 200 artists, is a fun way to fill a weekend afternoon. 5. Spend some time outdoors. 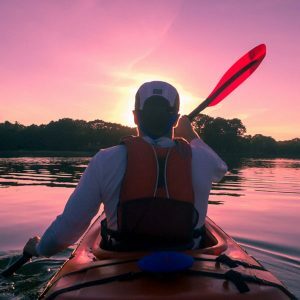 Go for a hike or go kayaking on the French Broad. Here’s a secret: Everyone thinks fall is the best time for a trip to the Blue Ridge, but us locals actually know the best season is summer! Check out Explore Asheville for some outdoor ideas. Another idea is to enjoy a day out on the French Broad River. The third oldest river in the world, the French Broad meanders right along the edge of downtown Asheville. Enjoy a guided-kayak, stand-up paddling, or tubing trip down a short length of the river to see Asheville from a different perspective. Spend a day at Biltmore House and Estate. You will enjoy the beautiful gardens and the stately home that has housed the Vanderbilt family for centuries. 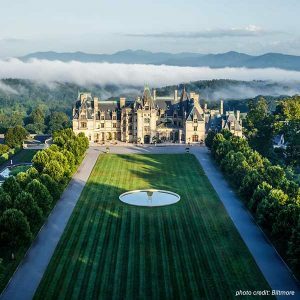 Built in 1895, Biltmore House and Estate is still America’s largest house today.